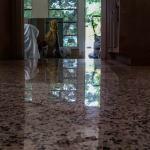 This page, as well as this entire site, is designed to give homeowners who have terrazzo floors information to help them decide if their terrazzo floors can and should be restored. I talk to people every day about their terrazzo floors. Over the years I have come to understand many of their concerns. 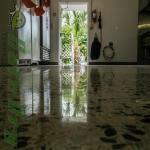 Many terrazzo floors that can be restored are turned down by companies because they lack the experience and knowledge to find and fix the problems. Conversely, some floors are taken on by companies that get in over their heads or do not understand the problems they are faced with. At SafeDry, we do all the work ourselves. 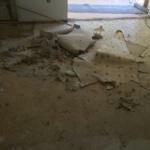 We never hire subcontractors to work on any of our customers floors and we never subcontract any work out. I hope this page and many others on this site can give you the knowledge to understand what can and cannot be done. If you like what you see please “like” us on Facebook. The Facebook “like” buttons are at the top and bottom of this page. 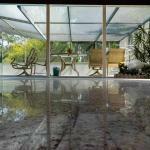 How do I know if I have a terrazzo floor? Many new home owners look under the carpet hopping for wood. 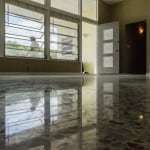 That is unlikely in Florida, but some are shocked to see terrazzo. I hear these stories every day. Terrazzo floors were installed during original construction in banks, schools, government buildings, airports and many homes in Florida built between 1950 and the early 1970s. You can recognize it by the stone chips in the floor. In Florida it can usually be seen in the door step of the front door. It might be painted, or tiled, so it could be hidden. Terrazzo is the hot floor now. 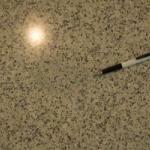 Everyone is starting to understand that terrazzo is the greenest, easiest floor to keep up and can last for centuries. No tile, carpet or vinyl can make the same claim. 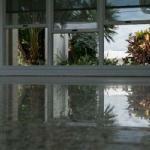 Florida’s old terrazzo is mostly made from Portland cement and marble chips. These floors may be stained, have hundreds of chip holes from old carpet tack strip or still be covered with tile and these floors can look better today than they looked sixty years ago. Today we can fill those chip holes, remove old stains that have been in the floors for years and tear out almost any covering to get to the floor. 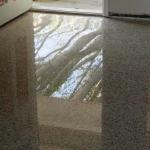 What is left after, after we restore you terrazzo floor, is a beautiful, continuous, long lasting shine. 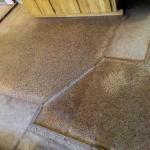 Click here to learn about preparing to have your terrazzo restored. 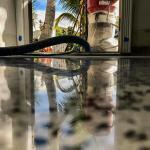 SafeDry does terrazzo restoration in Sarasota, Venice, Fort Myers, Port Charlotte, Bradenton, Cape Coral, Naples, Englewood, North Port, Punta Gorda, Nokomis, Tampa, Marco Island, Siesta Key, Lakeland, Winter Haven, Gainesville, Sun City Center, Orlando, Melbourne, Daytona, New Port Richey, Holiday, and Hillsborough County, and most places in between. Click on the name of your city above to see pictures from your area.